Put some work into your lawn each fall, and you'll be rewarded with a healthy carpet of green next spring. Follow this lawn care checklist and get advice on how to seed your lawn for lush spring growth. Use this handy checklist to pamper your lawn this fall and prepare it for its long winter nap. Before heading to the garden center to pick up fertilizer or lime, have the soil tested. Dig up about half a cup of soil from several different sections of lawn and place each sample in a plastic bag or cup. Label each sample with the day, time and place collected, and be sure to tell the place conducting the test what you plan to plant in the area. They'll need to know that information in order to make accurate recommendations. Take the sample to your local nursery and garden center or call your County Cooperative Extension office to see if they conduct soil tests. Some do the tests on site, while other offices provide expert insight into the test results. Depending upon the soil test results and recommendations, you may need to head to your local garden center to pick up amendments. 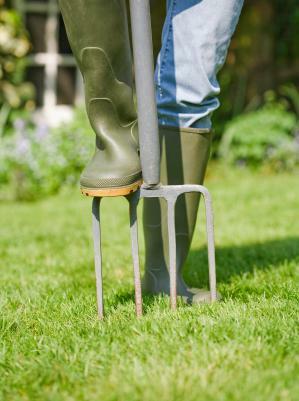 One of the best things you can do is to aerate the lawn to loosen the soil and allow the grass to expand. The roots will grow deeper, and nutrients can easily flow throughout the soil. You can aerate your lawn using a pitchfork to systematically pierce the ground, but having a professional company come out an aerate your lawn is far easier. Home improvement stores also offer rental equipment for do-it-yourself types. Choose a lawn fertilizer based on the recommendations of your soil test. If you didn't get the soil tested, choose a fertilizer specifically for your type of grass. Some experts recommend a fast release fertilizer because of the slowed microorganism activity. Others insists homeowners continue using slow-release fertilizer so it doesn't burn the lawn. You may want to try one of each on small test patches to see which works best. Instead of bagging grass and leaf clippings, mow them into the lawn by allowing your mower to shred everything into compost. Both will add nutrients to the soil. Fall is a great time to tackle grubs in your lawn. Adult beetles lay their eggs in the month of July, and they'll mature throughout the winter months. This means you could have a large infestation in the spring. You can use pesticides or organic controlling products to help you to get rid of pests like this in the soil. Ensure you water your lawn well after applying grub killers to it, as this will ensure the product gets deep into the soil where these grubs live. Many lawns benefit from patch seeding in the fall. Rake any bare spots and sprinkle seed directly onto the bare sections. Continue watering until close to the frost date for your area. Be sure to shut off and drain any sprinklers and irrigation systems so water does not freeze in the pipes. 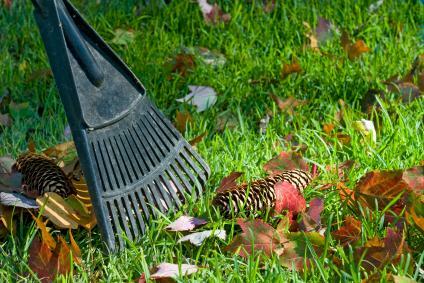 Throughout the fall months, remove debris and leaves from the lawn. 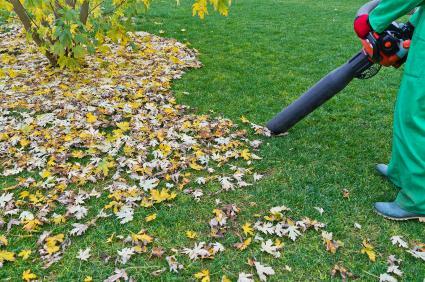 If you do not remove leaves, or you leave them in piles on the grass, the grass will suffer by discoloring or worse. Grass needs air and light to remain healthy. Cut the grass one last time after it has stopped growing. Make this cut a high one so the grass is able to take in nutrients as much as possible during the last few weeks before winter sets in. Cutting the grass low prevents the grass from storing important nutrients it needs. Never cut the grass when it is wet as this can lead to significant damage to the grass especially at this time of the year. The typical suburban lawn is planted with cool-season grass or warm-weather grass. It's important to know what kind of grass you have growing in your lawn now when you choose the seed to plant. If you plant the wrong kind of seed, you could end up with patchwork lawn as some parts green up while others turn brown. Warm season grass: Warm weather grasses, on the other hand, love the heat but turn brown in the cool weather. Zoysia grass is an example of warm weather grass. 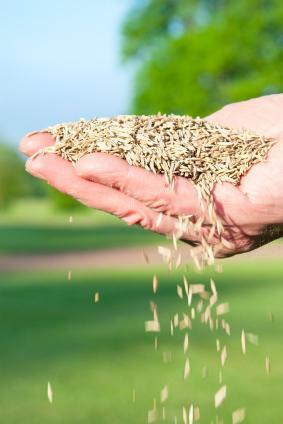 Grass seed blends: Many homeowners prefer seed blends. These blends combine various types of cool or warm season grasses into one convenient mix that's suitable for your gardening zone. Blends may also contain weed and feed type additives, or additional materials that suppress weeds and provide a fertilizer boost. Seeding should be part of every fall lawn care regimen. Before seeding, apply any recommended soil amendments or lime to the entire lawn. Follow the package directions. Some may recommend you wait a few days before seeding to allow the fertilizer to work its way into the soil. Identify the dead or sparse patches. Rake to loosen the soil. Sprinkle the seeds according to the package directions. You can use your hands or dip a trowel into the bag of seed to spread it easily. Spread the seed evenly and as thickly as you need to, making sure to cover most of the bare spot with seed. A broadcast seeder, either the kind you hand-crank or a larger one you walk behind and push like a lawn mower, also works well to seed large areas. Do not cover the seeds with soil; grass needs light to germinate. Some homeowners use weed-free straw strewn over newly planted grass seed or burlap to prevent birds and other animals from eating the seeds and retain moisture. Water the area well, and continue watering daily until the grass seed germinates and grows to be at least one inch tall. Although the grass slows growing in the fall, it doesn't sleep entirely. The cooler temperatures place less stress upon the tender shoots and seeds so they can sink their roots deeply into the soil. Soil bacteria and microorganisms also break down soil matter into usable nutrients for the grass to absorb. Fall is the most critical time period for proper lawn care because it sets the stage for healthy growth in the spring.